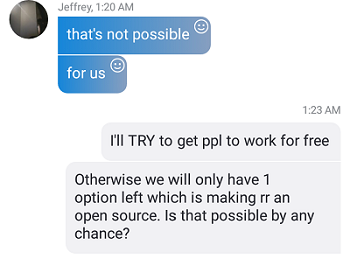 (17-07-2018, 10:52)Abed Wrote: I don't rly remember you talking about the open source beside the conversation we've had about the other community becoming an open source. It's a bit too early to open source it. I completely agree what Rocky said. You better try to improve the script and not post it publicly.LSCNR have been my favorite server but also i love this community.Nobody took care of the LSRCNR and that's why the server is destroyed.Same situation with Ress server.I'm disappointed.But anyway good luck! (18-07-2018, 05:55)[C5]JS7457 Wrote: It's a bit too early to open source it. RUSH has been here since 2011, thanks. Yea sure, sell what others worked for and spent years to release it you gready fucker. (18-07-2018, 15:47)Letonia. Wrote: Yea sure, sell what others worked for and spent years to release it you gready fucker. Who tf are u to use leto's name ? I'm against, everything explained Rocky spent 2 years working hard on that gm while you were taking care of your family and just watching him working alone and now after he's done with it you're trying to open source/selling it, nope we don't need that you guys better search for a good solution. Support from my side, others don't have CnR, but I doubt they would accept, they could be afraid of loosing players.